Research has indicated that mother squirrels have personalities which are essential for the growth rate and survival of their pups . Researchers at the Kluane Red Squirrel Project in Canada found that red squirrels have a range of personalities, from exploratory and aggressive to careful and passive. 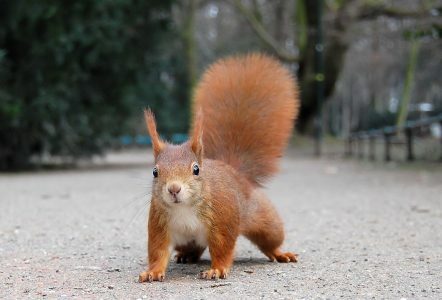 Both kinds of squirrels persist in the population because neither personality type offers an exclusive advantage for survival. The team described personalities of red squirrel mothers and the effect personality has on the fitness of their pups. “We used to think of behavior as being unbelievably flexible, and that it could adapt based on immediate circumstance to increase fitness.” said researcher Andrew McAdam. “More recently, researchers have been finding that organisms are actually more consistent in their behavior. They may not be as flexible as we thought.” he said. Giving a squirrel a personality test requires an open mind, the proper tools and patience. McAdam said that measuring a squirrel’s reaction to one situation could predict how it will behave in other circumstances. To measure personality, squirrels were placed inside a large open box with holes in the floor, a mirror and a video camera. The way the squirrel explored the box and its reaction to seeing itself in the mirror also was measured. Because they don’t recognize their reflection, they think their reflection is an intruder. These tests were used to determine the activity level and aggressiveness of the squirrels. In addition, researchers found squirrels that were active explorers were more likely to attack their reflection. In years with abundant food, McAdam said, more active squirrels use their extra energy to their advantage and the pups grow faster. When food is sparse, their high-energy lifestyle is costly and the offspring of passive squirrel mothers have the advantage. “There is a range of personalities in squirrels because the personality that is better for fitness depends on the year.” McAdam said. Mother squirrel personalities also affected pup survival rates. Pups from aggressive mothers had lower survival rates when they were in their mother’s nest, but it wasn’t clear if it was a result of maternal style or other environmental effects. Once they left the nest, they had better survival rates through the first winter. McAdam said it’s likely that this is because they are better at competing for territories than other pups.